Firstly we recommend reading the article named building a shed base. 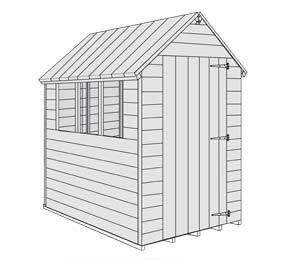 Once a level shed base is laid (it is imperative to be level to ensure that the shed can be assembled correctly), the shed can be built in little time following the provided step by step instructions. We would recommend a general fixing kit to include a hammer, powered screw driver, etc ready to assemble this building. 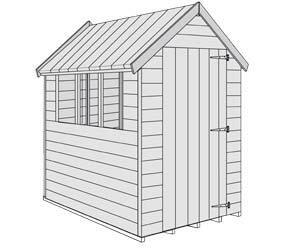 BillyOh sheds come complete with a full fixing kit including all screws, nails, door fixings, etc sufficient to assemble the shed. A helpful hint if the space is available is to lay out all the panels in the correspondent places around your work area, ready to just be lifted and secured in place. 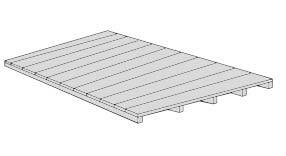 If the shed floor section is pre assembled this is a simple case of laying this down on the level base. 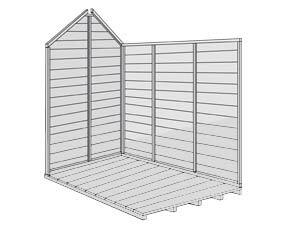 Solid Sheet sheds may require additional assembly which will all be broken down in any provided instructions. Larger Sheds such as workshops, garages, etc will use multiple floor sections which just need fixing together. The back shed panel (Back Gable) is then fixed to one of the shed side panels using nails. Following this the other shed side panel is then nailed to the shed back panel (Back Gable). Do not nail the shed to the floor at this stage as it restricts the movement in the building when attaching the roof panel. The shed front panel (Front Gable) is then attached to two shed side panels. The shed roof panels are then nailed in placed ensuring that the shed sits square. Now that the shed roof is fitted, the remaining shed walls can be nailed to the floor. The shed roof is then finished by tacking the roof felt in place and attaching any final strips. 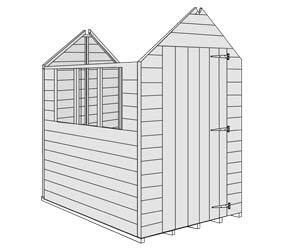 It is highly recommended to ensure that the shed is treated in an annual basis with a quality wood preserver. Please see the product options for our range of shed treatments.